The military court that acquitted the officer also imposed a fine of Rs 10 lakh on the army for the harassment faced by the soldier. 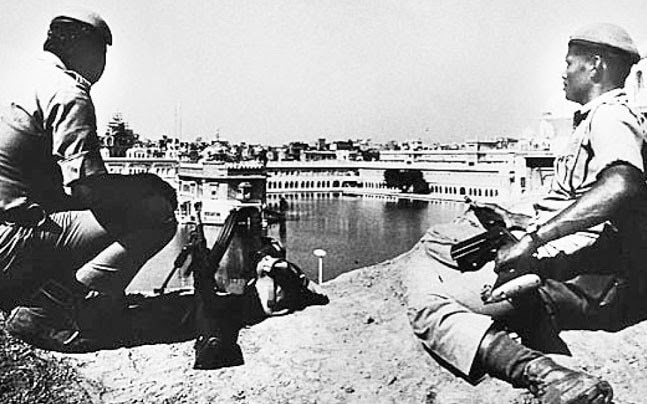 Soldiers keeping watch on Golden Temple in June 1984. About 1,000 people died during the military raid against Sikh separatists hiding at the holy shrine. An officer accused of taking away electronic items, including a video cassette recorder and a colour television from Amritsar's Golden Templeduring Operation Bluestar, was acquitted 33 years later by a military court. The tribunal also imposed a fine of Rs 10 lakh on the army for the harassment faced by the soldier. K A Singh, who was recommended for Ashok Chakra for his role during the mission to flush out terrorists, including militant religious leader Jarnail Singh Bhindranwale, had to retire as a Major from service because of the punishment. According to the plea filed by the officer, after he and his team had secured the temple complex from the terrorists inside, the troops recovered four electronic items from a building on fire, which included a VCR, a three-in-one music player, a made-in-Japan Akai Deck and a colour TV. About 1,000 people were estimated to have died during the military raid in 1984 against separatists who had been demanding an independent homeland - Khalistan - in Punjab. Later that year, prime minister Indira Gandhi was assassinated by her Sikh bodyguards, triggering a further wave of retaliation in which nearly 3,000 members of the community were killed. In the plea, the officer stated that the items were brought to the battalion headquarters in the presence of the then commanding officer of the 26 Madras unit, Lt. Col. K M G Pannikar, who decided to keep the recovered articles in the unit as souvenirs of the role played by it. The items were moved from the operational site in Amrtisar to the unit base in Jalandhar. While the officer was busy in sending off bodies of the jawans who were killed in the operation, the commanding officer instructed the troops to keep the electronic items inside his house in his absence. However, they were again shifted to another officer's residence after Maj. K A Singh objected over the issue before the commanding officer. Afterwards, the brigade commander ordered a search of the houses of the officers of the unit based on anonymous complaints and the items were recovered from one Major V Ganju's house. The court of inquiry held at the time also found that eight officers, including the commanding officer, were responsible for the "illegal detention" of the electronic items, but strangely, the army decided to punish only Maj KA Singh. It was also established that one Captain BS Pawar had also illegally retained a Webley revolver recovered from inside the Golden Temple. The authorities found that the troops of the unit had also kept other things unlawfully including Sten guns, napkins, bed sheets, khukris and kirpans from inside the shrine. But the officer claimed that he was the only one against whom action was taken while some of the fellow officers went on to become seniors in the force. When Singh filed a plea against the punishment, his commanding officer also vouched for his personal integrity and honesty while recommending his case, but still his petition was rejected by the force. The Armed Forces Tribunal accepted his appeal saying, "we feel that the heat of Operation Blue Star resulted into quick action against some persons, including the petitioner without application of mind and verification of genuineness of allegations." The court said the officer suffered on account of arbitrary action on part of respondents to cool down the heat and this spoiled his whole career. The AFT set aside the Army's punishment of reprimand awarded to the officer on account of alleged misconduct and asked the force to promote the officer to the rank of Lt Colonel and pay him all his dues in the next four months along with a fine of Rs 10 lakh to be paid in the same time period. THE OFFICERS RESPONSIBLE FOR HARASSMENT.SHOULD BE PUNISHED AND THEIR PENSION SHOUD BE STOPPED.AN EXAMPLARY PUNISHMENT SHOULD BE GIVEN SO THAT THIS 'SCAPEGOAT' MAKING PRACTICE WILL COME TO AN END. This happens to be one more example of Lack of understanding of fellow beings.I happen to be one of the unlucky witness on all that happened on the aftermath of `Bluestar`. I just returned after completing an ERE in NCC. The soldiers were divided in faction and they created an unruly atmosphere! It betrayed the average mindset of the people in general. Faith and ideology reacted violent, and men never tried to see the truth; The truth that man is one and equal and the consciousness is common to all. All that divide is the man made faith in the name of religions and ideologies. Ideologies that kept each group a separate island . And they vehemently fought with hatred to keep his own faith to be on top.Its going to destroy the planet unless truth is the only value to be cherished.And love is the only god that saves!